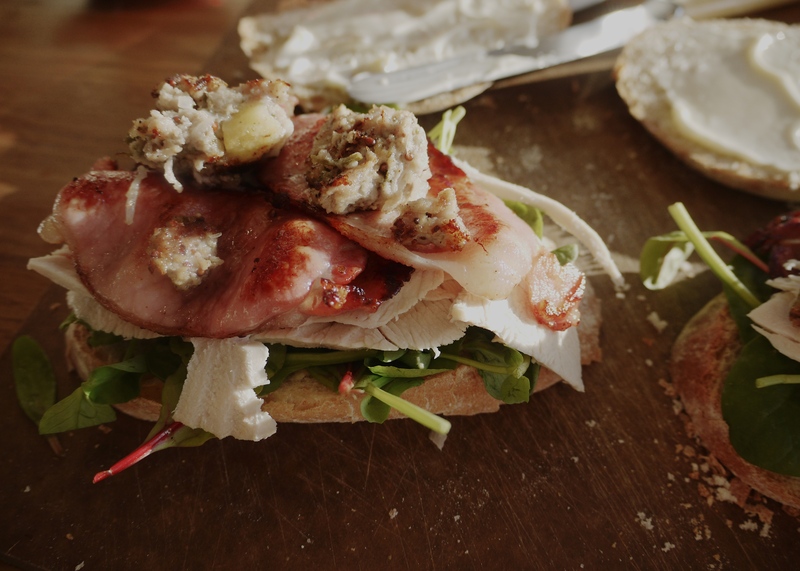 There’s little more satisfying than a festive leftover. G&G house rules mean that anything not eaten, even a meagre spoonful of congealed cheesy leeks, gets cling filmed, fridged and considered for anything up to 5 days before it is grudgingly, and I hasten to add, rarely, disposed of. And after 10 days of utter indulgence, it’s not surprising that I have a fridge full of little tupperwares, tinfoil parcels and cling filmed bowls that need using up. All those oranges, cloves and cinnamon sticks won’t keep til next year so put them to good use now with a warming wassailing tipple. Pop the cider, cloves, star anise and cinnamon in a bowl and heat gently. Halve the orange, squeeze the juice of one half into the cider and pop the other half in the cider un-squeezed. Warm through, remove from the heat and leave to infuse of half an hour. When ready to serve, pop it back on the heat, bring to a simmer and add the sloe gin and honey to taste. Serve with a piece of orange peel and a chunk of cinnamon. I don’t understand people who, at first sight the christmas pudding bleat, “oh but it’s so rich, and I’ve eaten so much already, I couldn’t possibly. And heavens, certainly not with custard as well“. It’s alien to me. At g&g towers it only comes with custard. And it comes in large portions. Get over it. Scald the milk and cream in a pan together with the scraped vanilla seeds and empty pod. Meanwhile, beat the egg and sugar together. Once hot, gradually pour the milk and cream over the egg mix, whisking constantly. Return to the pan over a low heat and bring the custard 79 degrees, stirring all the while. 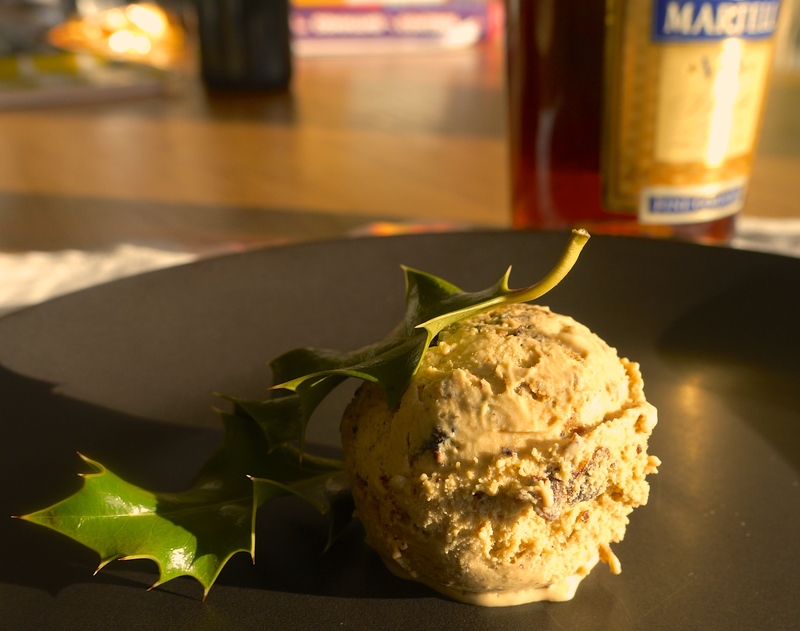 Once thickened, pour the custard into a cool bowl, crumble in the christmas pudding plus a glut of cognac and chill. Churn in your ice-cream maker as instructed. I’m a big fan of making the most of leftovers too, we’ve been grazing on gravlax, turkey and Stilton for ages and the turkey stock is already making it into risotto and soup. In fact we almost enjoyed the Boxing day leftovers more than the Christmas lunch this year and considered cooking the Christmas lunch on Christmas Eve next year and immediately storing it ready to enjoy as bubble and squeak with pickles the next day! Love your ideas and inspired to use sloe gin in mulled cider.